The latest single from Baltimore's Anti-Matter label features Massachusetts based John Kolodij's High aura'd with Reuben Sawyer's Blood Bright Star. It's an enticing pairing, as both artists complement each other with instrumentals that are evocative and quietly uplifting despite their differing constructions. 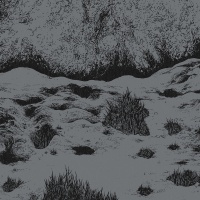 High aura'd's contribution here is like listening to the aftermath of a storm, as drizzling rain and windswept hues give way to a pensive atmospheric hum where ringing distorted guitars meander gently before swelling into a loud cyclical buzzing drone accompanied by faint ethereal vocals that lift this up towards the heavens. On 'Remain In Light', John Kolodij, aided by the airy harmonies of Glenna Van Nostrand (of Omnivore), creates a slow, moody construction using volume and an assortment of guitars - including acoustic, electric and pedal steel - and field recordings. Blood Bright Star's 'Golden Blood Part II', on the flip, hinges around a Krautrock groove fleshed out with tumbling guitar notes and some classic pedal steel touches. Those light rippling tremolo effects cast against some distorted tones, are played out in a bluesy, psychedelic and atmospheric manner conjuring up visions of barren American landscapes.